SQL Sentry Performance Advisor is a performance monitoring and tuning solution that offers information on SQL Server and Windows performance. SQL Sentry Performance Advisor is an advanced performance monitoring, diagnostics and tuning solution for Microsoft SQL Server that provides awareness and control over the true source of performance issues. 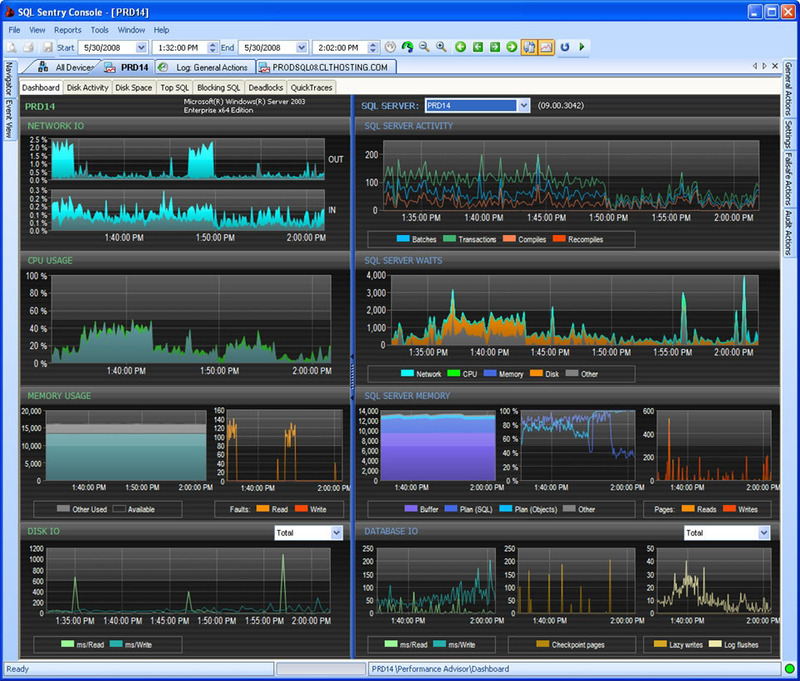 SQL Sentry Performance Advisor displays critical SQL Server and Windows metrics side-by-side in a single view with real-time and historical modes. SQL Server Disk Activity: Patent-pending graphical view of a server's disk topology and activity highlights bottlenecks at the database file, physical disk or controller level. SQL Server Disk Space: Monitors SQL Server disk capacity and graphically displays where various database files reside on the disk system. Top SQL Analysis: Low-overhead tracing system captures stored procedures, batches and statements with multiple executions of the same SQL normalized and aggregated to show the largest performance impact. SQL Server Blocking: Hierarchical display of blocking chains illustrates the full scope of any block. Wait Resources are automatically resolved to show which tables or indexes are being contended. SQL Server Deadlocks: Graphical display of all deadlock types shows the concise information needed to determine the root cause of performance problems. The synchronized grid-based display lists all nodes organized by resource, owners and waiters and includes the full SQL for all nodes. Quick Trace: Provides a complete picture of which processes are working on the server by correlating trace and process activity data. One click or automated tracing gathers full statement and process level details. Calendar View: Integrates with SQL Sentry Event Manager to show Top SQL, Blocking and Deadlocks on a single display with other events. System requirements: Windows 2000, Windows XP, Windows Vista, Windows Server 2003, Windows Server 2008, SQL Server 2000, SQL Server 2005, SQL Server 2008, Microsoft .NET v2.0 Framework, Minimum Single 1.6 GHz CPU, 512 MB RAM (SQL Sentry Console), Minimum Dual 1.6 GHz CPUs, 1 GB RAM (SQL Sentry Service), Minimum Dual 1.6 GHz CPUs, 2 GB RAM (SQL Sentry Database). Pricing: $1,495 per SQL Server instance. Quick Start 5 Packs are available for five SQL Server instances for $4,495.